There is Hank Huckaby the man and Hank Huckaby the lifelong public servant; Hank who was the first in his family to attend college and Hank who, as chancellor of the University System of Georgia from 2011 until he retired at the end of 2016, has been an activist who made bold, positive changes in post-secondary education that have improved the academic experience for tens of thousands of Georgia students – and increased graduation rates by 14 percent. Underlying both his personal and professional accomplishments is a key personality asset. “I don’t let my ego get involved,” he says. Looking back on his noteworthy achievements – in particular, successfully steering the university system through budget cuts and transforming the system into a national model – he insists that the key was surrounding himself with the right people. As chancellor, Huckaby’s focus on financial issues was broader than mere budget cutting. His aim was to move more money toward the academic enterprise and change the paradigm of education in America. Under his auspices, Georgia recently joined the nonprofit Complete College America program, a nationwide alliance dedicated to helping underrepresented populations complete certificate and degree programs. That road soon lead him to teach at DeKalb College (now Georgia State University Perimeter College) and Emory University, to serve as the senior vice president of finance and administration at UGA, and then as a legislator in the Georgia House of Representatives. But it was while at college that he met the two people who have most influenced his life: Amy, his wife of 52 years, and Zell Miller, who taught American government during Huckaby’s freshman year. The young Huckaby was later tapped to serve as budget director during Miller’s eight-year tenure as Georgia governor and subsequently worked on Miller’s successful senatorial campaign. 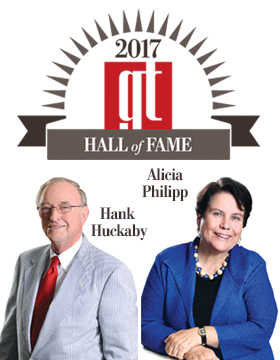 Alicia Philipp was only 23 years old when she became the first employee of the Community Foundation for Greater Atlanta in 1977. Her first job out of college was with Central Atlanta Progress, an association of downtown business leaders helmed at the time by Dan E. Sweat Jr.
As it turns out, Sweat was the only connection Philipp needed not just to move onto her next position as the first, and at the time the only, employee of the Community Foundation for Greater Atlanta, but onto a career that has benefited untold numbers of Atlantans and beyond. Created in 1951, the Community Foundation for Greater Atlanta serves a 23-county region around Metro Atlanta and had just $7 million in assets when Philipp was hired. As of year-end 2015, the foundation held $920 million in assets, receiving more than $113 million from donors and granting out more than $140 million to some 6,800 nonprofits focused on things like community development, education, arts, well-being and nonprofit effectiveness. Retaining the passion of her 23-year-old self, Philipp isn’t quite ready to relinquish her title of “dean” of Georgia’s community foundations, but someday she envisions a “triangular” life for herself spending time between her condo in Decatur, working on women’s economic development issues in Guatemala, and visiting her daughter and first grandchild in Portugal. Founder & Chairman Emeritus, Aaron’s Inc.
Chairman/Founder, H.J. Russell & Co. Retired Board Chairman & CEO, Synovus Financial Corp.
Former Board Chairman, Cousins Properties Inc.